It was an action-packed week at KIDmob’s Superhero Boost workshop. Eight kids with limb differences or who are wheelchair users experimented with voice and vision technology, powered by Google AIY kits, to create body modifications and wheelchair augmentations. 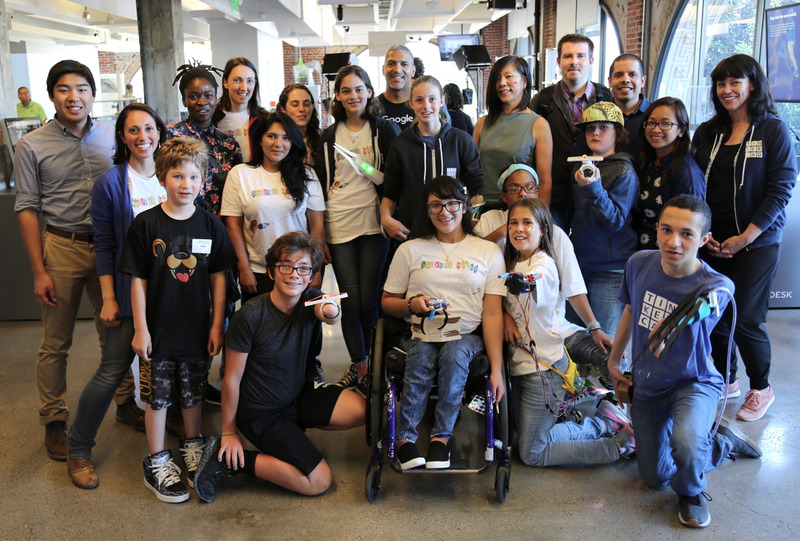 For four years, the nonprofit KIDMob has been doing design workshops with kids who have upper and lower limb differences, but this is the first time they’ve incorporated Google AIY Kits into a workshop. Google AIY Kits let you build intelligent devices that see, speak and understand. They’re for anyone interested in tinkering and exploring creative applications of technology. The workshop was named “Superhero Boost” to encourage kids to stretch their thinking about what is possible for their prosthetics and wheelchairs. They spent the first half of the week brainstorming around superhero capabilities like morphing, strength, and surprise to generate ideas both assistive and cool that showcased their personalities. Our friends at Autodesk hosted the workshop and had 3D printers firing on all cylinders to support rapid prototyping of ideas. A team of Google engineers was on hand to help the kids solder and program their ideas for intelligent wearable devices with superpowers. By the end of the week, kids were able to show off a Swiss-army-knife inspired mod for design tools, an arm that can retrieve objects and foster more independence, and a blinged out neopixel design for evening bike rides, all powered by voice technology. During their final presentations, the kids shared how the experience of making with AI makes you feel like a wizard—it doesn’t get more super-powered than that! If you’re interested in helping kids further their project ideas, you can sign up to be a volunteer with KidMob at themob@kidmob.org.